Tito completed the Coliseum. The stage suggests grandness. 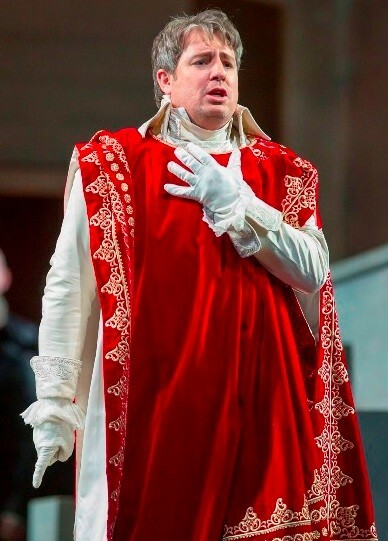 Matthew Polenzani debuts as Tito. 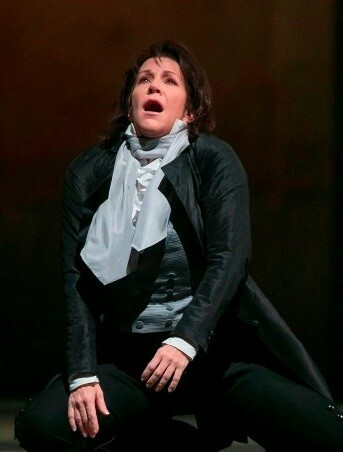 Great mezzo Joyce DiDonato inhabits Sesto. Amanda Majeski (Vitellia), Joyce DiDonato (Sesto), Cecilia Hall (Annio), David Greeves (Leutolo), Christian Van Horn (Publio), Matthew Polenzani (Tito), Emily Birsan (Servilia). La Clemenza di Tito is full of the most glorious Mozart arias and recitatives, and an occasional duet. It is an odd opera, which does not have a developing story arc, but rather presents one emotionally-telling vignette after another: thwarted love, political trickery, treachery and betrayal, noble friendships and a hero’s stance. Marie Lambert, who drew a noteworthy performance from Johan Botha in the Lyric’s Meistersinger, has done wonders with the artists who are often stationary and alone in this Mozart opera. 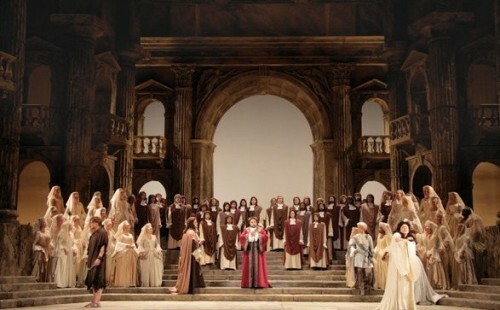 Lambert does not violate the opera by attempting interaction, except in Tito's struggle with his betraying friend Sesto and the love shared by Vitellia and Sesto. The Emperor is probably a more important object of their attention if not affection, but passion one-ups him. All the characters engage. The brisk, threatening presence of the Praetorian Guard and Publio their leader, keep the politics of 1st century Rome front and forward. The Guards are wise to be on guard for treacherous acts against the Emperor as they are in the works. The women’s voices were particularly noteworthy in the production. Vitellia, sung by Amanda Majeski, displayed everything Mozart would have wished.Her voice is clear as a bell, with a lovely light vibrato, shaping phrases that scampered across the octaves with sensitivity and drama. Emily Birsan as Servilia flutters firmly as she renounces the Emperor’s offer of marriage. Tito finds her rejection to be an act of courage. Feelings triumph over practical politics. Would that more Roman citizens had her power to speak the truth. The audience titters. But Birsan's voice, again pure Mozart, lifts up the lovely notes. Her singing helps us understand her attractions, as phrases draw us in. Servilia's preference is for Annio, Cecilia Hall in the trouser role. Hall is a first-rate artist coming to the fore. Among her larger roles she was terrific as Concepcion in L’Heure Espagnole at the Julliard School. Annio is a tough role to pull off. A thoroughly good man, Hall takes the potential wimp out of Annio. It is clear why he is a preferable companion to the Emperor. Joyce DiDonato is Sesto. A consummate actress, she has a voice for the ages. Sir David McVicar, whose production this is, says no one digs deeper than DiDonato. Yet only the effortlessness of a disciplined artist is apparent. She gave us lesson in the use of breath to form tone, dynamics and phrasing. In the beginning was the breath, and you do not even notice it when DiDonato sings the lovely Mozart music. The most famous air from the opera is her first act “Parto, parto ma tu ben mio.” Accompanied beautifully by the Lyric Orchestra’s first clarinet, Charlene Zimmerman, the music of exquisite grace is indelibly imprinted. McVicar’s sets, designed by the director, make use of the height of the stage. This production was originally mounted at a palace in Aix en Provence. The moving steps which appear stage left give the Emperor a chance to be both above it all and on the level of earthlings. Sesto grovels, making the contrast of position even more dramatic. No curtain separates the audience from the stage. Lighting begins and ends the presentation. A soft spotlight from stage right is focused on the artists as they perform. Jennifer Tipton’s lighting is always surprising and apt. This being McVicar, red light symbolizing Rome in flames and also bathed in blood starkly contrasts with the muted grays and blacks of the palace. Tito’s costume is a shimmering white and makes him appear three-dimensional when he enters the stage tableau which seems to flatten. Matthew Polenzani is making his debut in the role. A native of nearby Wilmette, he is deservedly an audience favorite. He speaks about the difficulty transitioning in this role from supreme commander to an ordinary earthling, with all the feelings man is heir to. He negotiates the transitions well. The orchestra was conducted by Sir Andrew Davis. A harpsichord helped place us in Mozart’s time. Whatever is said about the construction of this late opera seria, and whatever comparisons are made with the earlier da Ponte librettos for Mozart, the score is simply glorious and listening to the singers makes you yearn for this heavenly music to go on forever. At the Lyric it will.